Is E-Cigarette Safer Than Traditional Cigarettes? E cigarettes are much safer than traditional cigarettes. In December 2018, a study entitled "Comparison of exposure to e-cigarettes and harmful substances in cigarettes" was published in the JAMA Network Open Journal. The researchers analyzed urine samples from 5,105 participants, compared traditional smokers and e-cigarette users, and concluded that e-cigarettes are much safer than traditional cigarettes. The study found that e-cigarette users were exposed to nicotine, nitrous acid, and some metal substances and VOCs had biomarker concentrations below 10 percent to 98 percent. In addition, some users have detected high-concentration chemicals because they use inferior products purchased through informal channels. Therefore, when purchasing electronic cigarettes, you must recognize the brand and choose a guaranteed company. 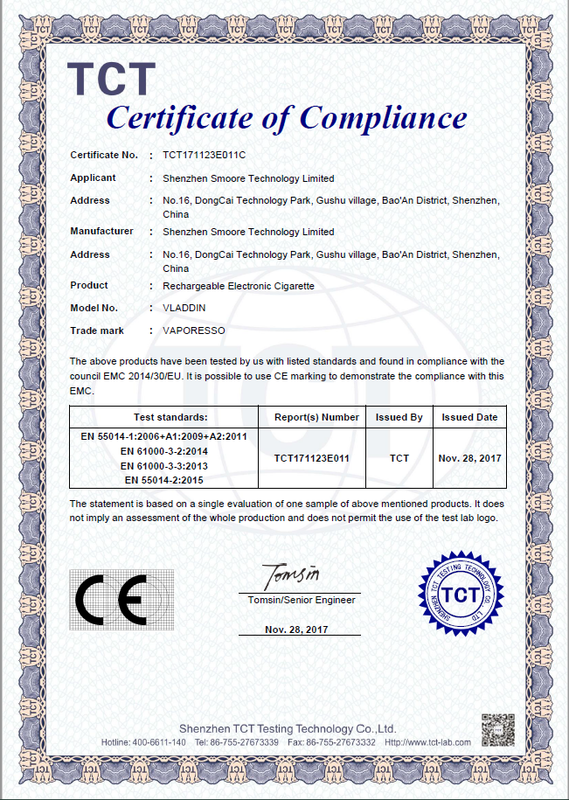 The materials used in Vladdin e cigarettes are in line with international safety and hygiene standards, and both CE and Rohs certificates are available for both suits and empty cigarettes. It is made of safe and non-toxic materials and can be purchased with confidence. Therefore, Professor Maciej Goniewicz insists that e-cigarette can only be used as a substitute for smoking. The quit smoking tool is used by everyone because it can reduce the damage to the human body more than traditional smoking articles. However, it is not recommended for non-smokers to use e-cigarettes for a long time because it is not certain whether it is harmful. So choosing a safe, guaranteed company is especially important. Electronic cigarettes are becoming more and more recognized and accepted by people. So what advantages does e-cigarette have over traditional cigarettes? No carcinogens, healthier E-cigarette is a non-combustion type of electronic atomization equipment. It uses advanced microelectronic technology and physical atomization technology to atomize the nicotine dilution liquid extracted from tobacco into a mist. Humanization simulates the whole process of smoking. The main components of smoke oil are VG (vegetable glycerin), PG (food grade propylene glycol), food grade spices, nicotine (optional addition) and water. VG and PG are commonly used food additives, which are harmless to the human body. Moreover, the electronic cigarette has no burning process, so it does not produce tar and carbon monoxide, thereby eliminating various carcinogens in traditional tobacco. The UK Ministry of Health has issued a research report that e-cigarettes are 95 percent less harmful than flammable cigarettes. No secondhand smoke E cigarettes do not burn, and do not produce tar and other substances like cigarettes. The smoke generated by them is actually water vapor. So for people around the smoker, there is no problem with secondhand smoke. Smokeless odor People who smoke all the year will carry a thick smell of smoke. This taste will penetrate into your clothes, hair and even the items on the house. There is a smell of nose and nose. The smoking of electronic cigarettes does not have a strong smell of smoke, but instead produces a sweet and sweet taste. For example, fruit flavor, mint flavor, ice cream flavor and other fresh flavors of smoke oil, and can quickly evaporate and disappear into the air. No yellow teeth, no bad breath Smoking itself produces an unpleasant odor that sticks to the teeth and oral mucosa. The longer it takes, the heavier the odor. Long-term smoking can cause yellowing of the teeth, tooth stains, bad breath and even yellow and black nails. E-cigarettes do not burn, and the main components of smoke oil are VG (vegetable glycerin), PG (food grade propylene glycol), food grade flavors and water. The smoke generated by it is mainly the atomization process of the smoke oil component, so there is no problem of bad breath, yellowing of teeth and nails. Environmental protection E-cigarettes do not produce soot or cigarette butts like cigarettes and are more environmentally friendly. There is also no fire hazard due to the creation of an open flame. Quit smoking Effectively reducing the dependence of traditional cigarettes can be used as an auxiliary tool to quit smoking.